When it comes to your customers, a “one size fits all” approach to educating them about your product or how your business can help them simply won’t work. There are several different learning and communication styles represented, not all of which will be compatible with the ways in which you choose to format your communication or educational resources. Understanding your customers is critical for any business. If you get this bit right, it helps you to ensure that you communicate appropriately and that they understand you too. Increase the number of qualified leads you have? Having your business goals in mind before kicking off any education initiatives will help to ensure that you stay focused on those items which are really important for achieving those goals. Most SaaS have limited resources when it comes to budget or bandwidth for producing and promoting educational resources, so keep them targeted. Before creating your educational resources, lay out your goals for them. In order to produce more effective resources, you really need to have a good grasp of who your ideal customer is first. This is so that you’re able to both attract the right customers in the first place, and provide them with the educational resources which will best suit them. First of all, have you clearly defined the problem/s your SaaS is solving? Your ideal client identifies themselves as having that problem and it is annoying enough to them that they will pay for a good solution. Once you’re clear on the problem or problems you solve, first look at the broader categories of businesses or individuals who have this problem, then narrow them down to specifics. For example, could your target customer be the CMO of an enterprise? A sales representative of a SaaS? A solopreneur? If you want to be even more targeted, you can go even deeper and determine the exact industry they are in. How educated are they? How pressed for time? Basically, the more details you can build into a customer profile, the better it will help you devise the right education strategies. It will also save you from developing redundant strategies. A CEO probably doesn’t want to sit through 30 minute webinars, for example. Identifying the ideal customer who will pay for your solution to their problem is a great first step in helping you understand your customers, now you need to work on getting them to understand you. Many SaaS make the mistake of thinking that if they blast out a list of features, those will be enough to draw in those ideal clients, but you’ll find that many customers don’t really understand those features. In fact, they may not even care. What they do care about is that you’re solving their problem in a meaningful way. This is where your education program comes in. No matter what segment of your sales funnel you’re aiming at or which goals you are looking to achieve, you will find that you encounter—and need to cater for—different learning styles. Visual – Just as it sounds, this person prefers diagrams, pictures, maps and presentations. Auditory – Learns best through listening and speaking. Kinesthetic – “Hands on” learners. Like to have tactile representations of information. Read and write – This group learns best through words. Do you see what we mean? If you were to decide that all learning will be done via an email course, you’ve probably just completely lost your auditory and kinesthetic learners in terms of actually completing your education program, possibly your visual learners too. Your “read and write” learners will however be happy. 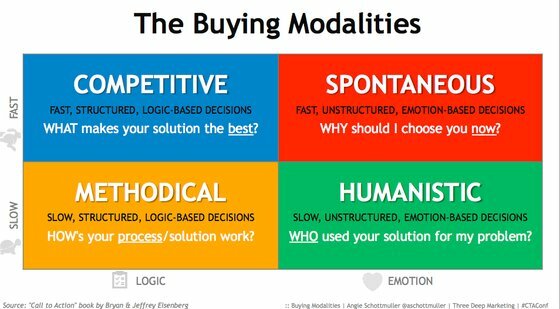 “Buyer modality” is another consideration to be aware of which can go hand-in-hand with how you cater to learning styles in your customer education. After all, your customer is not just a learner, they are (hopefully!) a buyer. This theory says that there are four fundamental personality types or “modalities” among your buyers. Those modalities are plotted on a chart with speed preference (fast vs. slow) on one axis and preference for logic vs. emotion on the other. Your competitive buyer will value smart, logical decisions which give them a clear competitive advantage. The methodical buyer is an analyst, drawn to data and processes. Spontaneous buyers are more likely to impulse-buy based on the thrill of a quick purchase and the simplicity of doing so. Lastly, humanistic buyers are interested in the “human” side, the real-life case studies and the affirmation that others like them are using your solution for the same problem. When you add in modality as a factor, you start to see that a good education program will not only cater to multiple learning styles, but will understand and deliver for buyer modalities, highlighting those things which each prefer. There are companies out there (SaaS or otherwise) doing a great job of customer education and people are taking notice. For example, AirBnB puts out a lot of educational material for hosts, helping them to run a better business, get better reviews or just ensure the safety of their property. Canva offers a quick onboarding video to new users, but then has a great library of design tips and tutorials in the form of their Design School. To make things even easier, users can browse Design School by category and cut through anything they don’t need. Dropbox has a file already created for you when you join which teaches you how to use it. They engage users further by offering rewards for taking their tour. Never overlook the “horse’s mouth” as a good source for ideas on improving your customer education program. Survey your customers or even call some of them and ask how they find your educational resources and whether they could suggest any improvements. Besides asking, put steps in place to measure the effectiveness of your education programs. Keep metrics on how many customers go through your resources and which seem to be the most popular. Developing a quality education program for your customers is an important part of ensuring that you retain more of them. Part of that is understanding them so that you can help them to understand what you are about. Know exactly what problem you are solving and who needs that problem solved enough to pay for it. Develop a profile of that ideal customer so that you understand their needs and what they will expect from your educational resources. Recognize that there are different learning preferences as well as buyer modalities which impact how effective your resources will be. It is always a good idea to create different types of resources which will meet these varying needs. Lastly, keep a finger on the pulse of what’s working by measuring and gathering feedback. Actionable feedback will guide better resources and boosted customer engagement. How can you create resources which cater to different preferences? Subscribe here for this extra guide.